The z13 is IBM's first new mainframe in almost three years, and it shows the company continuing to invest in a product that's still relied upon heavily by banks, airlines and other big firms, while logging steadily lower sales each year. The z13 gets a new processor design, faster I/O and the ability to address up to 10TB of memory -- three times as much as its predecessor. It can house up to 141 processor units in a single system and run as many as 8,000 virtual servers, the company says. IBM recently celebrated the mainframe's 50th anniversary, and one of the reasons it's still going -- even as IBM sells off its x86 server business -- is that IBM keeps refreshing it to handle new computing tasks. "It screams on traditional workloads like OLTP (online transaction processing), but we've also designed the z13 for the explosive growth in mobile," said Ross Mauri, general manager of IBM's mainframe group. Each time a person hits the "buy" button on a smartphone app, he says, it triggers a cascade of transactions behind the scenes involving credit card approvals, inventory and billing systems. The z13 can process 2.5 billion transactions per day, IBM claims -- equivalent to "100 Cyber Mondays every day of the year." Fraud detection is another big focus. The z13 will allow companies to analyze every transaction they process in near real-time to detect instances of fraud in banking, health insurance and other industries, according to Mauri. Today's mainframes allow health providers to analyze only about half their transactions that fast, he said. "We're guaranteeing you'll be able to do real-time analytics on 100 percent of transactions," he said. At a maximum 5GHz, the z13's processor is slower in terms of clockspeed than the chip in the z12, but IBM says it more than compensates for that with other improvements. The chip has eight cores compared with six for its predecessor, and it's manufactured on a newer, 22 nanometer process, which should mean smaller, faster transistors. Perhaps more important, the new chip is IBM's first mainframe processor to incorporate simultaneous multi-threading, allowing it to execute two instructions in parallel on each clock cycle. SMT has long been offered on x86 chips and more recently with IBM's Power processors, but the company hasn't added SMT to its mainframe chips in the past because the zOS mainframe software isn't written to take advantage of it. Newer workloads now running on the mainframe, like Linux and Java, should see big gains from SMT, however. "Because Linux workloads have grown so much on mainframes, we decided it was time to do it," Mauri said. Customers will have to wait and see what impact the new chip design will have on more traditional workloads. Mauri said IBM will "probably" enable zOS to take advantage of SMT in the future. The z13 also gets support for SIMD (single instruction, multiple data), another parallel computing technology long supported by x86 chips, which should speed up the mainframe's analytics capabilities. Analytics also get a boost from DB2 BLU for Linux, an in-memory database technology now coming to the mainframe. The z13 will also run Hadoop, IBM says, which is used to analyze big data sets. 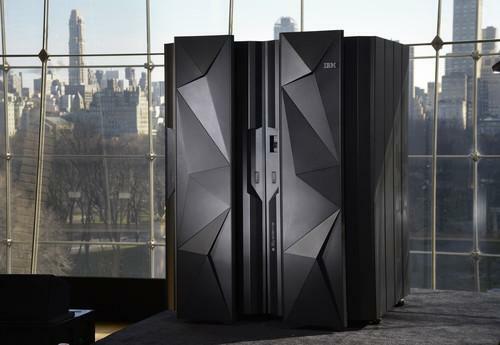 IBM doesn't give pricing for its new mainframes, but they can easily pass $100,000. The z13 is being installed for a few early customers this week and will be rolled out more widely in the coming months, Mauri said.